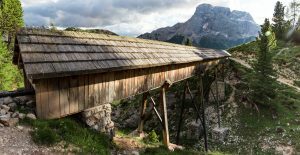 After the “warm-up hike” to Lago di Braies without full backpacks, our multiple day hike from hut to hut through the Dolomites was about to start. We had fuelled up on breakfast, packed our bags and now stepped outside the hotel. On our backs James and I had 13kg each with everything we would need for the next week. Break with a view at the Putzalm mountain hut. The first small stretch lead us through Niederdorf and along some pastures, before we entered woodland. From then on, we followed a small stream called “Graubach” for quite a while. Initially the incline was very moderate, but soon got a lot steeper after a short break. Even though we already considered the incline to be steep, it became even steeper once again. We slowly moved up the slope in a 45° angle. As we ascended, we lost sight of the Graubach stream, although we could still hear it further down in the gorge. After ages, we finally reached a small cabin called Putzalm. It was early in the season and the cabin all locked up, but there were some benched outside and a refilling station for water. We sat down for a bit of rest after the steep path in the forest. 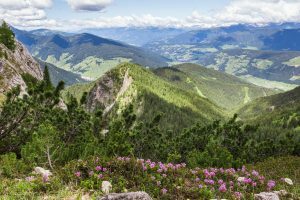 From the mountain saddle, we could see all the way back to the Pustertal valley. When we had had enough rest, we moved upwards once again and through some more woodland. On a bit where the trees had been cut down, we felt how warm it was in the sun. 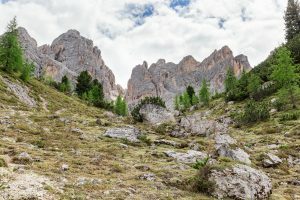 Not long after, we finally left the woodland and reached the rocky slopes leading up to the mountain saddle called Sarlsattel. The path now lead upwards in a narrow zig-zag. Not long after we had left the woodland, we had to cross the first patch of snow on our way. It was only small, but despite the warm and sunny weather it didn’t seem to melt very much. Although still steep, we enjoyed this part of the ascend a lot more. The rocky texture of the path was a lot less monotonous that the slope in the forest. On the surrounding mountains, some colourful types of rock were visible. Eventually, we reached the saddle point between the two mountains Sarlkofel and Lungkofel. The views were amazing on both sides. 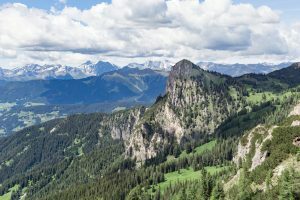 When looking back into the direction we had come from, we saw the forest we had passed through on our way and the valley with the little village of Niederdorf in it. On the other side, we saw what lay ahead of us. A high mountain group caught our attention. We would be passing around these mountains. On the slopes of these mountains, different colours of stone appeared. 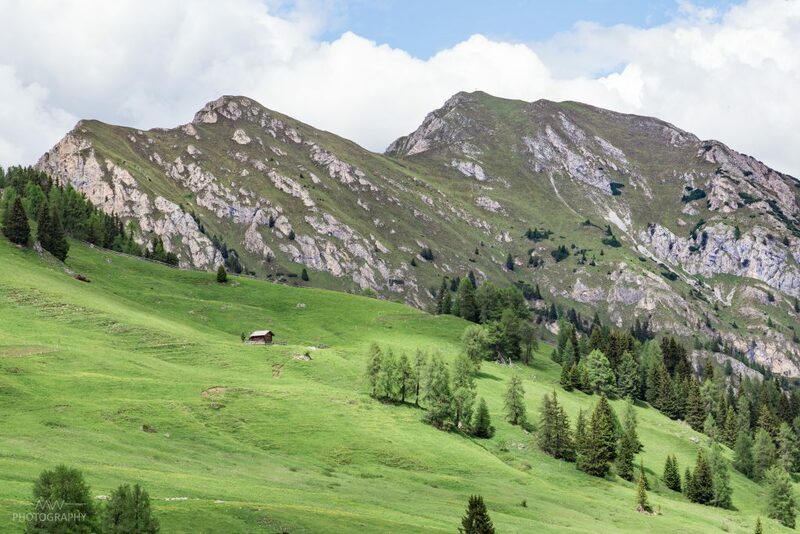 After passing over the Sarlriedl pastures, the most challenging part of the hike began. After a well-earned rest, we headed on. We knew that almost more that half of the way still lay ahead of us. From the mountain saddle, we descended towards the Sarlriedl pastures. Hearing the sound of cow bells somewhere near, we could only see some horses down the slope at a small lake for now. 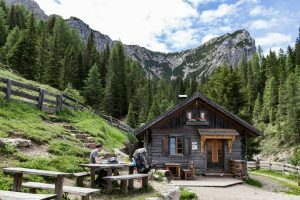 As we hiked on across the rich green pastures, we took one more short break to refuel on a bench outside a tiny wooden hut. Soon, we met the cows whose bells we had heard already. 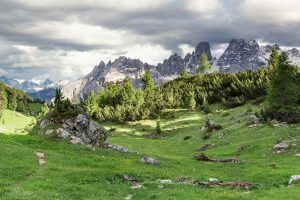 After the pastures of Sarlriedl, the path got rocky again on the way up to the Flodige Sattel mountain saddle. 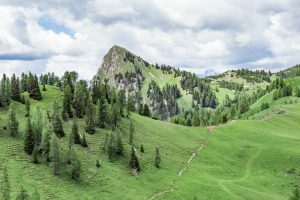 We passed over the Sarlriedl along a group of small rocky peaks called Messnerköpfe, before reaching the Flodige Sattel mountain saddle and passing around the Sarlkopf peak. After a short, but steep ascend, the path got even. It now lead along the scree flanks surrounding the Dürrenstein mountain. What seemed like a pretty easy and straight forward walk, soon turned out to be a lot more difficult than anticipated. We were at a height of about 2500m and in the middle of June, snowy patches weren’t rare at all. We had to watch out steps carefully, but figured out the best technique quickly and weren’t slowed down too much by these bits. 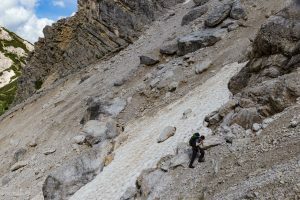 Patches of snow and loose scree made the path more challenging than expected. The much bigger problem were bits of loose scree. 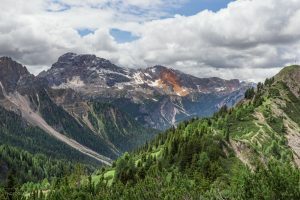 It seemed that during spring many landslides of scree had come down the slopes of Dürrenstein mountain. While the well-trodden path along the slopes was easy to hike, these freshly formed bits were a lot more difficult to pass. Not being trodden down, the boulders were very loose. We had to carefully test each step before putting all our weight on the foot, to make sure the scree wouldn’t slide down and take us with it. Sometimes, a landslide had taken away a whole chunk of the path. We would reach the edge of the gap formed and we would see a marking for the path 10m away, but no path in between. That forced us to carefully step down into the formed groove and find a way across and out of the groove again. With all these difficulties thrown into our way, we almost forgot to stop every once in a while and take in the views. When we actually took our eyes off the tricky path and turned around, the view was awesome. After many of those patches of scree, we finally set our feet on a firm path again. 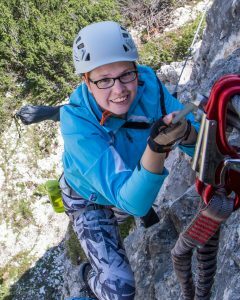 A rocky slope had us steeply zig-zagging up to the wind gap Kirchler Scharte. With the extreme focus on every step over the scree came the exhaustion. Our speed had definitely declined already. On the wind gap, we only took a short break nevertheless. On a neighbouring mountain some dark clouds were accummulating and we still had a way to go, so we zig-zagged down again on the other side of the wind gap. When the path evened out again after the short descend, steel cables provided something to hold on to along a tricky patch of rock. Wooden stairs lead up again along the scarp of the mountain. Our hopes that this would be the end of scree slopes were disappointed. Once again, we had to carefully walk across loose scree on the slopes of the mountain. We even saw some leftover bits of steel cable that had previously been there to help cross the scree. One of the landslides in spring must have taken these hiking aids down. There was nothing that we could hold on to. Finally we reached even meadows. What a relief! After what seemed like forever, we set out feet on firm woodland path and found ourselves in the middle of a little patch of wood. We were relieved, but not yet sure whether this was the end of scree slopes. Only when we reached the meadows following the tiny patch of wood, we dared to be relieved. With our legs being tired, we half walked and half stumbled across these meadows. We didn’t have to watch our steps that closely anymore and took in the pretty view in front of us. Several little streams ran across the grassland. Out of nowhere, a wooden bridge appeared that seemed to perfectly fit into the Harry Potter films. With the mountains in the background, this sight created a magical atmosphere. This little wooden bridge seemed to be taken straight out of the Harry Potter Movies. It was only a 10 minute walk down a slightly declining sandy path, before we finally reached Rifugio Vallandro. The feeling of having reached our destination for the day was indescribable. It turned out that it took us 11 hours to complete this hike instead of 9 hours as planned. We hadn’t been as fast due to the difficult scree slopes. The ice cold coke and dinner that followed at the hut were delicious and refuelling. A shower gave the much needed refreshment after this long and exhausting day, before we had an early night. It didn’t even take 2 minutes, and we were sleeping already.